Extra-long 30 m industrial videoscope which is equipped with innovative laser illumination and scope articulation technologies. It delivers unprecedented image quality and maneuverability. The versatile IPLEX YS features innovative air articulation technology, letting you freely manipulate scope articulation with the compact palm-held controller. Since the insertion tube need not be fully extended, you can unroll only the length which is needed for the inspection and leave the rest neatly and safely coiled on the internal storage drum. During inspections, it is sometimes difficult to determine the area and direction being displayed on an inspected image. 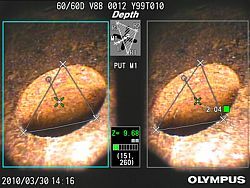 The IPLEX YS features an integrated gravity sensor that provides an on-screen orientation of the inspected image, clearly differentiating up from down. An optional length indicator can display the scope length inserted into an object on the screen; it can also be reset for a relative length from a given point in an inspection area. Utilising these functions, you can confidently proceed with inspections knowing they will be able to clearly identify inspected positions. During field maintenance, inspections must proceed even where rough objects and dusty, drip-laden environments can present obstacles. The IPLEX YS insertion tube is engineered for high resistance to abrasion and can be inserted into a wide range of objects, even those with rough surfaces. The lens cleaning system blows away fine dust and drip residue on the scope tip, ensuring efficient inspections that produce clear images. Not only can the IPLEX YS handle complete inspections, its all-in-one design lets you conduct them almost anywhere. At sites lacking an AC power supply, it can be powered by a lithium-ion battery. The scope articulation is operable with a small CO2 cartridge; no bulky air compressor is needed. IPLEX YS provides laser illumination to the scope tip for exceptional brightness. The IPLEX YS is the first industrial videoscope to incorporate laser illumination, 2X brighter than a conventional long-length videoscope, featuring low power consumption. It offers a comprehensive range of interchangeable optical adaptors for optimal magnification and direction. You can easily view a wide variety of inspection environments. The 8.0 inch. daylight-view monitor delivers vivid images both indoor and outdoors. Our unique image processing capability, WiDER (Wide Dynamic Extended Range), brings out detail in shadowed and highlighted areas to produce bright, contrast-balanced images across the entire depth of field. The IPLEX YS provides a number of post-inspection functions to support your analyses. You can record JPEG still images and AVI movies into a removable Compact Flash card or USB flash drive, and use the ImageNotepad to enter extended descriptions on recorded images. While you type, a list of predicted words is displayed when you enter a letter, simplifying and accelerating text input. Your descriptions are immediately accessible as part of each image when inspected data is transferred to a computer. Stereo Measurement technology permits accurate, three-dimensional defect measurement at any target angle. You can easily measure size, depth, and area of erosion, corrosion, and waste during inspection. 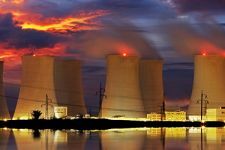 Quantitatively measured calculations of a defect ensure inspection reliability. Our unique Spot-Ranging function, the industry's only real-time tip-to-target distance measurement feature, navigates the scope tip to the optimum distance from a target. You can then easily determine whether the tip is close enough to calculate the most accurate measurement on the first try. InHelp Viewer software features image data management and precise measurement of objects in recorded images. Available free from our website, InHelp Viewer is ideal for remote users to re-measure or validate saved-measurement results. This advanced software features information editing and report generation, enabling you to efficiently prepare inspection reports. IPLEX YS Industrial Videoscope is built-to-order. Adjustable Gain Control 4 step adjustable gain control with exclusive WiDER® brightness level balancing technology. Recording Media Compact Flash card (1GB standard, compatible with recommended Compact Flash cards up to 4GB). USB Flash Drive recommended. Overlay 30-character title with date, time and system settings. Additional data can be input to an image using the ImageNotepad® tool which provides the capability to insert up to 10 additional descriptions to an image, displayed by categories and contents. Audio Recording Recording Format WAV format, 60 sec max. Liquid Resistance All parts Operable when exposed to machine oil, light oil or 5% saline solution. Waterproofing Insertion Tube Operable underwater up to a water pressure equivalent to a depth of 30 m.
Not operable underwater with stereo measurement tip adapters. Remote controller and LCD monitor Operable in rain. Not operable underwater. *1. Indicates the optimal focal distance of the tip adapter. *2. The adapter can be inserted into a ø8.5 mm hole when it is mounted on the scope. A range of the IPLEX YS tip adapters meets the optical requirements of various applications. The portable CO2 cartridge can be fixed onto the IPLEX YS, letting you manipulate scope articulation without a bulky compressor. Note: Please consult a sales representative for the recommended model. One battery lasts approximately 2 hours under normal operating conditions. Re-charge time: 90 minutes. Extends the remote control cable, permitting free movement during operation. These movies show the versatility of the Stereo Measurement modes.